Trusted Locksmiths are a genuine local locksmiths based in Essex and cover the Essex and Greater London areas. We provide a 24 hour locksmith service for emergency lockouts and also offer lock changes, upgrades and repairs for domestic and commercial properties. We pride ourselves on good customer services, a 1/2 hour response time and can also provide a female locksmith on request. Trusted Locksmiths provide a genuine 24 hour local locksmith service to Romford, Ilford, Brentwood and all surrounding areas. Where possible we always try to open doors and locks without damage and without the need for new locks. All our vehicles are fully stocked with a wide range of lock sizes and therefore we are able to change most locks required on our first visit. Although all of our locks are extremely reliable, everything we provide comes with a 12 months guarantee, parts and labour which gives our customers peace of mind. Insurance companies require a British Standard or equivalent lock on your doors. We are able to offer free no obligation security advice to ensure that you are covered by your contents Insurance. If you are worried that your locks do not comply with your insurance company requirements, please do not hesitate to contact us for free advice. 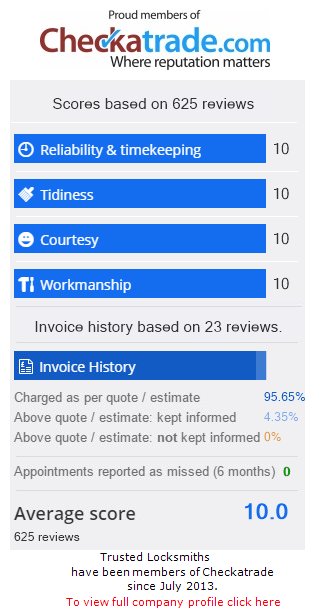 All our engineers are uPvc specialists and can provide a repair, servicing and replacement service for all types of uPvc and multi-point locking systems. We also upgrade old uPvc door mechanisms by replacing old out of date mechanisms for the state of the art hooks and bolts mechanisms.